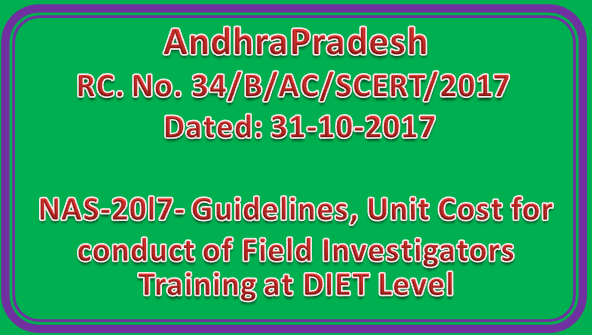 Sub- School Education - SCERT - Andhra Pradesh — National Achievement Survey — 2017(NAS-20l7) — Guidelines, Unit Cost for conduct of Field Investigators Training at DIET Level - Orders - Issued — Reg. Ref- 1. From the Joint Secretary. DSE&L. MHRD. GoI. New Delhi. D.O. No. 15-1/2017-EE,17. dated 19-05-2017. 2. Govt. Memo. No. 610151/Prog.II/A1/2017, dated 31-5-20I7. 3. From the Under Secretary. DSE&L. MHRD. GoI. New Delhi. Lr. F. No. 15-1/2017-EE. 13, dated 18-07-2017. 4. From the Under Secretary. DSE&L, MHRD. GoI, New Delhi. All the Principals of DIETs and Project Officers of SSA in the State are informed that the following financial guidelines may be followed for conduct of One day Orientation to Identified Field Investigators which will be held at DIETs from 1-11-2017 to 3-11-2017. An amount of Rs. 50.000/- (Rupees Fifty thousand only) Amount may be released to Principal DIET. After completion of the Programme. original Bills and Vouchers may be submitted to the Director, SCERT. Ibrahimpatnam. Vijayawada on or before 5th December 2017 from NAS Funds.